They’ve done it again here, in an anthology film which treats us to six stories of the Old West. In fact, a hand turns the pages of a large book between each sequence, as though we’re reading these stories, rather than watching them on the big screen. Not only does each story feature language and dialogue above that which might be expected of its characters, each story features an ironic twist, common to the Coen library of work. Not every story is funny; but each is ironic, and often paradoxical. In the most amusing tale, Nelson’s Buster Scruggs turns out to be an excellent shot, as well as happily arrogant. After provoking a group of outlaws at a saloon, he proceeds to kill them all, move on to a crowded burlesque house, eliminate the bad guy at the poker table, and then break into a song-and-dance routine that rivals the sailor scene in the Coen’s 2017 comedy “Hail, Caesar” in terms of creativity and sheer boldness. But don’t let the opening anecdote fool you. “The Ballad of Buster Scruggs” is not all light entertainment. The bloodshed is harsh and frequent, and the protagonists (save for Buster himself) are, if not all outlaws, those down on their luck – those trying to simply get by in a bleak and cruel world. And when death occurs (as it does frequently), we often see the open eyes of the deceased looking heavenward, as if to transport the soul to its final destination. The Scruggs bit is followed by a less interesting saga starring James Franco as a bank robber who almost survives two hangings. Then comes the saddest of the narratives – Liam Neeson as a former carnival barker who travels from village to village with an armless and legless man (Harry Melling) known as “The Great Orator.” He dramatically recites works of Shakespeare, Biblical tales, and Lincoln’s Gettysburg Address, as Neeson passes the hat collecting whatever coinage the locals are able and willing to spare. Neeson is a father figure to the Orator, although when he comes upon an opportunity to cash in with a mathematical genius rooster, all bets are off. 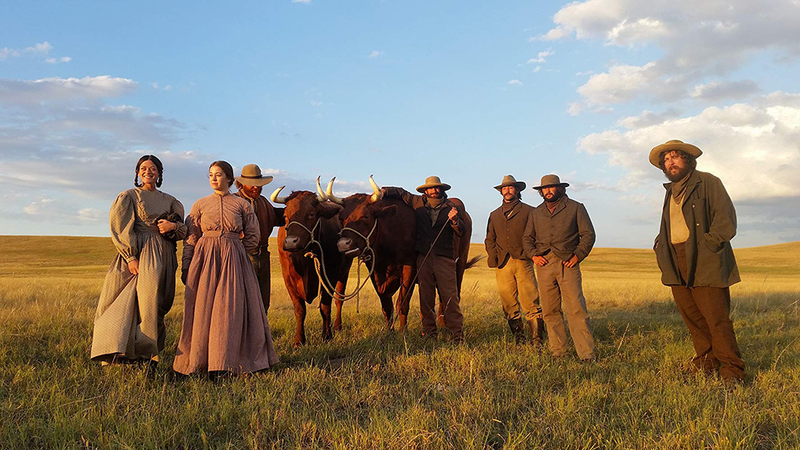 Zoe Kazan excels as a young traveler in a wagon train heading to Oregon in the longest sequence – one in which she loses her brother to illness, then accepts a proposal of marriage from the train’s leader, played by Bill Heck. The final story takes place almost entirely in a stagecoach, as five characters unfamiliar with one another travel from one city to another. Tyne Daly plays an upright and uptight Christian, put off by the bad breath of the fur trapper sitting next to her, played by Chelcie Ross, another character whose speech far exceeds that which might be expected. Brendan Gleeson and Jonjo O’Neill are upper-crust Britons who happen to be bounty killers transporting a dead body, and who (again) frequently break into song. The interplay amongst these characters is so much fun, it doesn’t matter that nothing actually happens during this sequence. I suppose an argument could be made that “The Ballad of Buster Scruggs” would have worked better had the Coens told each story simultaneously – cutting among stories the way Robert Altman did with “Short Cuts,” or the way Paul Thomas Anderson did with “Magnolia.” But in retrospect, “Buster Scruggs” works precisely because each tale is presented independently of the others. None of these stories has enough material to flesh into a full-length feature. But most of them are strong enough to warrant our attention. Much as the Beatles did on their classic album “Abbey Road,” there’s no shame in presenting a song (or a story, in the Coen’s case) that’s shorter than most. If there’s nothing else to say, move onto the next one. And that’s exactly what the Coens have done. “The Ballad of Buster Scruggs” is perhaps their best work since the Oscar-winning “No Country For Old Men” in 2007. And it returns the Coens to the Western – the genre in which they always seem to excel – for the first time since 2010’s “True Grit.” For two city boys from Minneapolis, who have made their homes in New York for years, it seems like an odd mix. And while they often parody their subject genres, they always pay homage to them – unlike, say Mel Brooks, whose material was straight-ahead spoof.